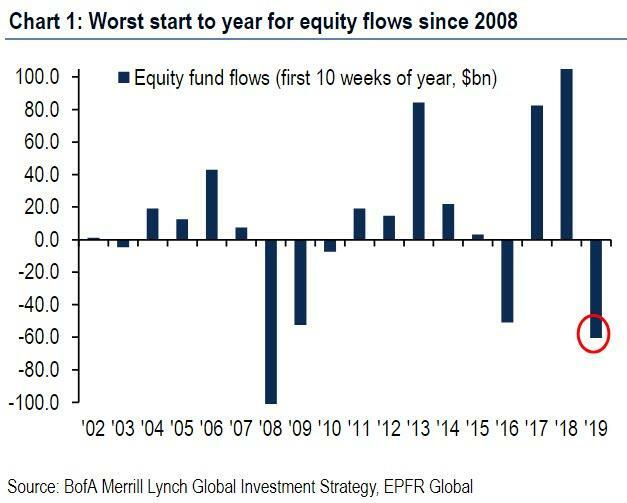 ... the bears finally threw in the towel in the latest week, when according to EPFR data compiled by Bank of America, investors bought a whopping $27.26bn of US stock funds and ETFs in the week ending on March 13th. 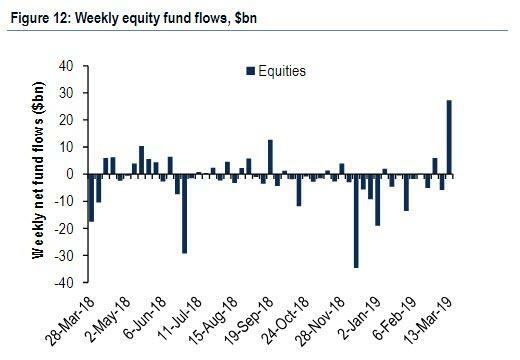 This was the second largest inflow on record, behind $38.30bn from March of last year, and contrasts with a mix of small inflows and outflows earlier this year, including a $5.83bn outflow in the prior week. Drilling down, despite this week's rather dreary volumes, BofA also notes that the $12.1bn equity buying on Tuesday largest daily bid since Sept. 20, 2018, the S&P 500 market top. Drilling down into bond flows, last week saw net inflows to high grade of $5.10bn, similar to a $4.68bn inflow a week earlier and $5.01bn inflow for the week ending on February 27. The split between short-term and ex. short-term flows was also little changed. Short-term high grade inflows declined a bit to $2.36bn from $2.55bn, while ex. short-term inflows increased to $2.74bn from $2.13bn. On the other hand, a decline in inflows to funds (to $2.58bn from $4.24bn) was offset by an increase in inflows to ETFs (to $2.52bn from $0.44bn). Continuing with credit, flows turned positive for both high yield (to +$1.18bn from -$0.93bn) and government bonds (to +$0.09bn from -$1.95bn). Inflows also improved for munis, rising to $1.20bn from $0.76bn. On the other hand outflows from leveraged loans accelerated to $0.55bn from $0.13bn, a 17th straight week of outflows, while inflows to global EM bonds declined to $0.93bn from $1.61bn. Finally, money markets reported a $1.27bn outflow this past week and a $30.43bn inflow in the prior week. Commenting on the latest fund flows, BofA's CIO Michael Hartnett notes the ongoing resilience of risk assets: minimal "profit-taking" on US-China trade truce news, poor Asian export data, ECB capitulation, and concludes that the "pain trade" is still up. Why? The answer is familiar and simple: the new highs in IG & HY bond prices, new lows in volatility (e.g. MOVE index), shows that central banks "all-in", and more importantly, "markets are not yet willing to trade policy impotence." Of course, if and when "policy impotence" becomes the dominant trading theme, it's all over.